An office table, a trash bin. People always think of a scene: a trash bin is placed beside the table. 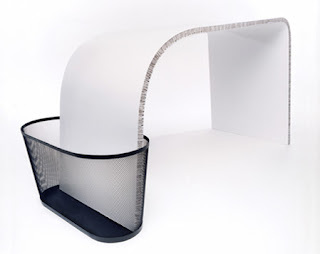 Nowadays, TABLE OF TRASH, designed by Marie Louise, has combined the table and trash bin. The smooth sharp of table makes waste paper and other trash drop into the trash bin more easily. It seems that the designer are fond of this creative design. Meanwhile, the table is made of thick paper board other than wood. Unlike other common paper board, the paper board is strong and light. For it’s only 4 kilogram, it is extremely suitable for SOHO.